Home / Do You Provide Filter Press Dewatering Solutions for Commercial Laundries? Do You Provide Filter Press Dewatering Solutions for Commercial Laundries? Micronics is a trusted leader in providing filter cloth and filter press dewatering solutions to leading companies in the commercial laundry, uniform cleaning & textile services industry. With Micronics’ filter cloth and filter presses, you will be able to reliably and cost-effectively dewater wastewaters with high solids content which may include lint, dirt, and emulsified oils and greases. Our filtration solutions will help with water reuse, too. The dry cakes that result from Micronics’ filter press equipment will be easy to dispose of as well. Ask us about our selection of trusted Polypropylene Multifilament, Monofilament, and Mono/Multifilament Filter Cloths that may be right for your high-oil industrial laundry application. Preventative maintenance services, filter press repairs, and refurbishment of your existing filter press – irrespective of the brand – are available from Micronics’ outstanding field services team. 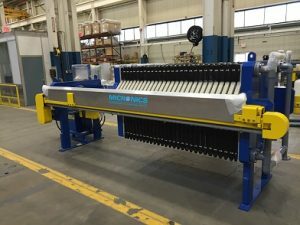 Contact us to learn more about Micronics’ filter cloth, filter presses, plates, press options & accessories, and services for your industrial laundry & textile services facilities. Our customers are committed to providing total customer care, and so are we.